It is axiomatic in astrology that "coming events cast their shadow," and I have read some of the rather dire predictions my fellow astrologers are posting relating to the astrology of this particular moment, including the great Grand Cross, plus two back-to-back eclipses that are coming this month, starting with the Full Moon Lunar Eclipse April 15, 2014 (3:43 AM EDT), and followed two-weeks later by the Annular Solar Eclipse on April 29, 2014 at 2:15 AM EDT. The fact that this lunar eclipse comes on Tax Day (April 15th) is pure coincidence, although it is perfectly acceptable to give meaning to coincidence, since after all it is two events which happen to perfectly coincide. Personally I don't consider national civil events any more meaningful than whatever focus they provide. New Year's Eve is a perfect example of a meaningless event astronomically, but one that still manages to evoke worldwide celebration. I prefer to celebrate the Winter Solstice instead, and so on. Anyway, what about these two upcoming eclipses and the planetary context in which they occur? What all the astrological hoopla is about is this Grand Cross that is forming between the now long-standing T-Square between Pluto Opposite Jupiter, both Square Uranus. That T-Square has been there for many, many months, so we all have had to just live with it and have probably forgotten what life is without it! But now, during this eclipse time, the planet Mars completes a Grand Cross to that configuration and makes a great square in the heavens. Such a Grand Cross is IMO the archetype of all possible aspects, the most meaningful. That is what astrologers are commenting on. Add to this lunar eclipse on April 15th the Conjunction of Mercury to Uranus, the Conjunction of Venus to Neptune, and the Conjunction of the Moon to its own North Node, and we do have a physically significant configuration. It does make for interesting times. Now, back-to-back eclipses traditionally describe a two-week period with an emphasis of one kind or another. I am not arguing the significance of this particular double-eclipse time. It looks to be energy-packed and perhaps crucial (cross-shaped) by definition, and with all the trimmings, such as the Mercury-Uranus Conjunction suggesting sharp mental insight (invention), the Venus-Neptune Conjunction suggesting appreciation or love of unity (spirituality), and the Moon-North Node Conjunction accenting our approach to other people and the public. And the Grand Cross itself suggests a deep urge for change, perhaps in our career or life path. That is all there, so look for an outer change in direction. I agree with that, but there is more to it than just that. What I am going to point out here is that another (and to me more-important) chart, that of the entire solar system (heliocentric) does not show any of this, aside from perhaps an inner relentless drive toward something or other and a greater accent on a need to control and restrain ourselves during this time. I have studied astrology for some 50 years, which is no guarantee I have learned anything, but nevertheless it is my opinion that while events may swirl around and outside us in these next two weeks, on the inner or spiritual side, which to me is the most important part of us, there is not all that much happening aside from a tendency to perhaps be more analytical than usual and to rather quietly stand witness to what is going on around us. We will take it in. I include both the standard geocentric astrology chart (outer happenings) and also the heliocentric chart (inner happenings) for the same planets and same moment, the Full Moon Eclipse of April 15th. 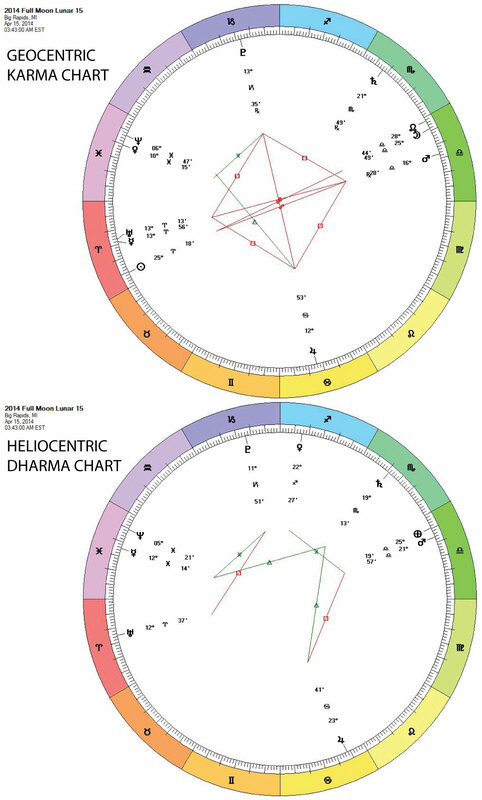 You don't have to be an astrologer to glance at these charts and see the one at the top with the Grand Cross (your outer circumstances) is much more defined than the one below it (your inner circumstances), which has no Grand Cross or even a well-defined Opposition. That is what I am commenting on here. The Karma Chart is loaded, but the Dharma Chart (what it means inside) is not, and is much more receptive and accommodating than active. I am not writing much these days, but thought I might write this to clarify what I understand to be going on in the heavens, so we don't get too worried about it.